1. 2 frame mounts w/6 mouting bolts 3/8"-16 UNC by 3/4" long, 2 7/16"-14 UNC by 4.5" long bolts w/nuts to connect motor mounts to frame mounts. See pics below for frame location, photos by Jeff Sapp. The white arrows indicate mounting holes for 350 frame mounts. 2. Shortshaft TH400 and driveshaft yoke from 1973-7 Pontiac Grand Prix. 3. Change suspension springs to 455 specs. 4. TH400 cross member frame mount different than TH350, use Anchor #2268 from Autozone. 5. The gas pedal and retaining plate will need to be changed since the TH350 uses a cable downshift while the TH400 uses an electric solenoid. All cars are pre-wired for a TH400 and if you look closely above the gas pedal you should see a yellow wire and black wire going into a plug. The yellow wire comes from the power supply from the radio. If yours is missing, all you need to do is run a power wire from the fuse box marked ign and then a wire to the TH400. Go to the salvage yard and get the necessary wire from any full size Buick, Olds or Pontiac since almost all of them came with longshaft TH400s. All 1968 A-bodies have the TH400 downshift switch and gas pedal regardless if they have the TH400. So, get the set-up from the 68s since the 69-72 have the set-up on if they came from the fact with a TH400 which is usually in station wagons and muscle cars. These are typically not in the salvage yards. Below is a pic of a set-up from a 1968 A-body minus the wiring. 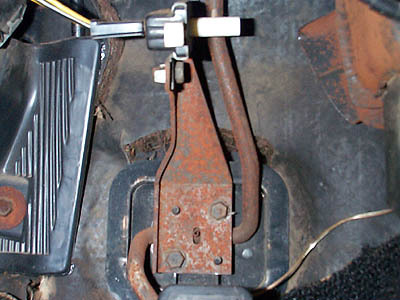 The second pic shows it installed on the gas pedal. 6. The TH400 dipstick and torque converter plate are different than a TH350. 7. The alternator / a/c bar (it goes from the water pump to the alternator then to the a/c compressor) from a 455 is 2" longer than a 350. 8. The fan shroud from a 350 will not work for a 455 so get a shroud if you can find one from any full size Buick Electra/ Le Sabre with a 455. 10. A 12 bolt Chevy rear is also nice to put in at the same time since these are quite a bit stronger than Buick 10 bolt rears. Most 12 bolts are found in 1970-2 Monte Carlos and some Canadian Built A-bodies. So do not overlook any A-bodies since you never know what you may find underneath. If you do find one and decide to put it in your car, you will have to change the driveshaft rear U-joint. Since you are ready changing the yoke to a TH400 change the front U-joint as well. 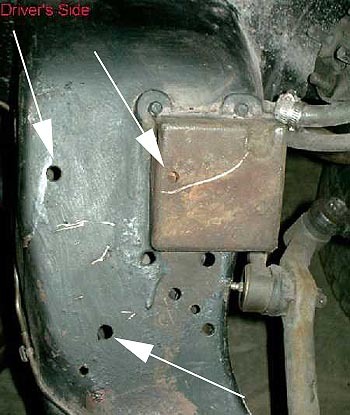 The U-joint for a 12 bolt Chevy rear is not the same as a BOP rear and is called an offset U-joint. The U-joint required is made by Neapco and is #3-3130 and costs about $25. 11. When installin the 455/TH400 set-up with a 8.2" rear, the driveshaft dimension from center of u-joint cap to center of u-joint cap is 55". If you are going to upgrade to an 8.5" rear, reduce driveshaft length to 54.25"
1970 455/400 with 8.2" rear end, shaft should be 55.10". Brown/blue tape. 12. If you are installing the 455 from a full size make sure you have the correct ps brkt so the ps sits next to the exh manifold. Some full size 455 engines have the ps brkt where it sits below the exh manifold and when you try to install this in a Skylark/GS the ps reservoir will hit the ps box. All brackets from a 350 bolt on to a 455 except for the upper AC brkt...see the other article on this site for more pics and details. Iron frame mounts may be replaced by aluminum versions available from TA or Postons. 1. 1968-9 two speed cars, ST300, use an electric solenoid on the gas pedal which will work for TH400. 2. 1968-9 models have less fan shroud space and full size Buick shrouds don't cleanly fit. An orig. 68-9 shroud can be cut to fit. Cut to match the fan blade diameter. 3. All brackets can be used from the 350 to the 455 with the power steering used if the water pump is notched where the belt travels. Once it is painted, it is not noticeable. The top ac bracket will not mount to the stock manifold directly, a spacer can be used. The alternator will need to be spaced to line up with the crank pulley and the ac pulley. 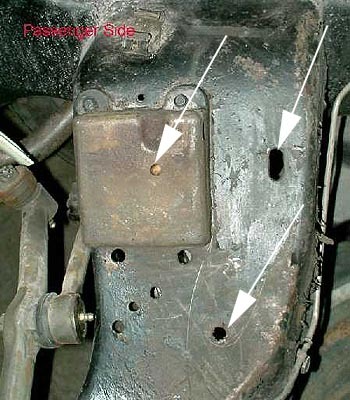 A dual pulley is required on the alternator if ac equipped. 4. If running an HEI the top radiator hose needs to be from a 69 GS400, the stock 350 lower hose will not fit cleanly. 5. 68-9 cars using 350 brackets, a long snout water pump is needed for the dual pulleys (ac, alt). It is a 1971 455 water pump. 6. The lower radiator hose is different than stock. The following will work: AutZone #CO823, Dayco #70511, Gates #20823, NAPA #7573.